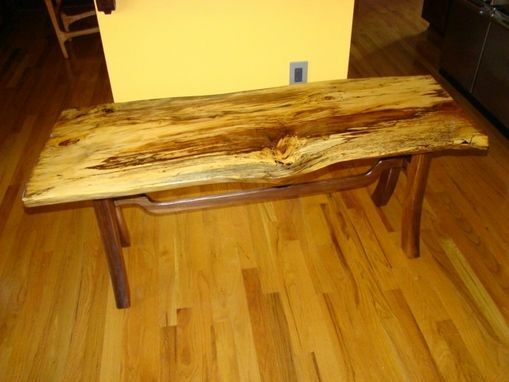 Custom made, natural edge coffee table. Beautiful grained table top is cut from felled red oak tree finished with boiled linseed oil and 3 coats of oil/urethane finish for high durability. Base is custom design, solid walnut wood, milled and fitted for the table top. This is one of a kind, heirloom furniture that will look beautiful in any craftsmen style home. Approximately 53"L X 20"W X 21"H.